Turtles-- they've become popular once more in recent years-- what, with the new Teenage Mutant Ninja Turtles CG cartoon out now and the upcoming movie. 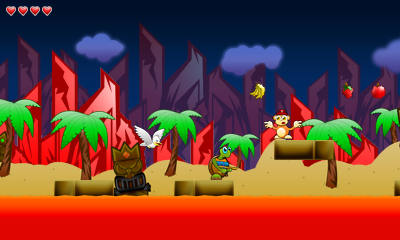 Now, one can get an alternate turtle experience with Saturnine Games's Turtle Tale, a 2D platformer that just released on the Nintendo 3DS eShop. Does it kick shell or does it give us a chance to use a turtle-related pun at the game's expense? but it doesn't make for a really bad game either. Do you have no experience with the platformer genre? Have you yet to experience the best of what the genre has to offer? If you answered "yes" to either of these questions, then Saturnine Games's Turtle Tale may be right for you. All others probably need not apply. 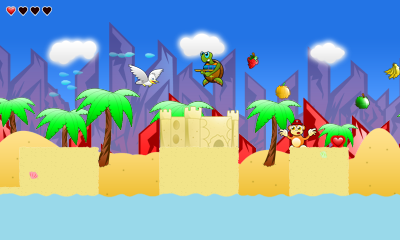 Turtle Tale is a very basic 2D platformer which features 15 rather dull levels full of ho-hum platforming and little variety. Oh, there's occasional levels with platforms that move and a screen that scrolls automatically, but these aren't very interesting in design either. 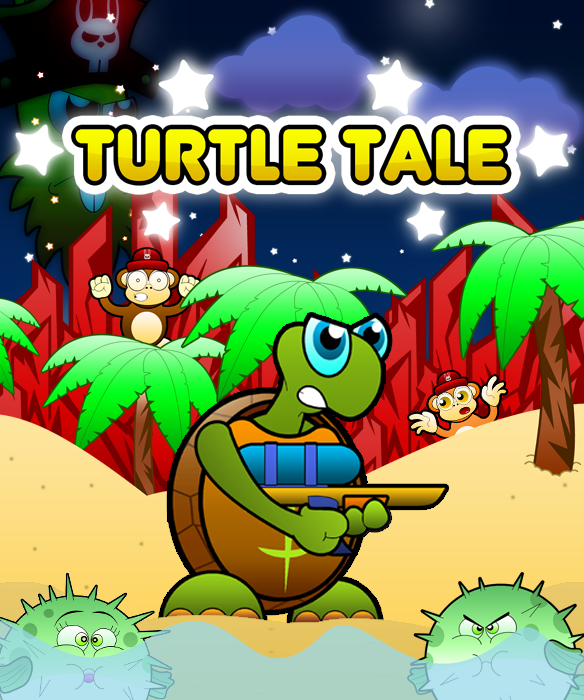 The fact that all levels seem like they were designed haphazardly with random placement of holes, enemies, and obstacles, make Turtle Tale's levels disappointingly poor. Even the end of each level doesn't have much in the way of pomp and circumstance. They just end, showcasing the level design's inability to create a feeling of increased intensity of challenges, depth, variance, or dynamics from the beginning of each level to its conclusion. 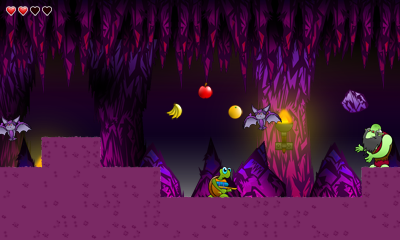 Each level features a set amount of fruit to collect. In order to unlock the hard mode, which beefs up the amount of enemies you have to deal with as well as gives less health to work with, you must collect all of the fruit in the game. This is insultingly easy, as they're pretty much all a breeze to collect, being on the path your character must progress on. The majority of enemies, most of which are simply sprite swaps, move in predictable patterns, with the occasional enemy that chucks objects at your character, a bipedal turtle with a water gun. The water gun itself is pretty weak as your turtle's offense. It doesn't squirt out in a steady, strong stream, instead it simply spews out with a weak burst in a downward arc, only a few feet away from its our hero. The inability to aim your water gun makes aerial enemies a challenge, and not a fair or welcomed one. Seeing as whenever the tenacious terrapin is hit by an enemy, he gets knocked back. This means that getting hit by an enemy and then falling into a hole due to the knock-back damage is a common and frustrating occurrence. Sure, you have unlimited lives and there are checkpoints, but as the game gets more challenging (i.e. 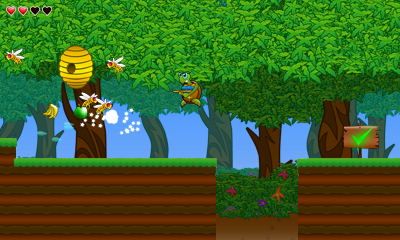 unfair) in its platform and enemy placement, Turtle Tale grows increasingly more tedious to complete. Turtle Tale isn't all bad, mind you. Shelldon, the main character, is brimming with personality and controls well. The premise of the game is cute enough, and the visuals, although simplistic, portray a world that is entertaining to look at. The music is serviceable, but it's ultimately something you won't remember as soon as you quit the game. Turtle Tale isn't a bad game by any stretch of the imagination, but it is also not a great game either. It doesn't do anything remarkable, and when it tries to do something special, the end result is flawed. Still, it's a solid effort that Saturnine Games made with Turtle Tale,. If you're in the mood for a low cost jump and run and aren't expecting the next Mega Man in the process, Turtle Tale is a suitable 3DS eShop title to try out. It doesn't kick absolute shell, but it won't leave you with a feeling of shell shock either.